Acca Kappa is an Italian line that was established in 1869. I believe they are best known for their brushes and other grooming products. In 1999 they opened their first US store in the Venetian hotel in Las Vegas. 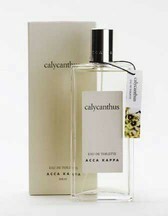 Today I am trying Calycanthus, which Acca Kappa describes as a "fresh, floral scent created with the unique essence of the Calycanthus flower blended with notes of Jasmin, Orange blossom honey and Musk." Calycanthus starts out sweet and sharp. I am guessing there is some honeysuckle in the top notes, and possibly a touch of citrus. The dry down is a lovely spring-like floral, with subtle green undertones. It has a beautifully spicy kick that I assume comes from the calycanthus — there are several varieties of this shrub, which are variously known as sweetbush, western spicebush, and Carolina allspice. It has a sparkling quality, and manages to capture the aroma of honey without being overly sweet. I wish I had something else to compare this to, but the only other calycanthus scent I have tried is Santa Maria Novella’s Calicantus. The Santa Maria Novella version is quite different, with notes of citrus, amber, and vanilla. If memory serves (and to be honest, mine rarely does), Calicantus is a sweeter, spicier perfume, with less of a floral character. Calycanthus is an Eau de Toilette, and has good lasting power. It is very reasonably priced at $45 for 100 ml. For buying information, see the listing for Acca Kappa under Perfume Houses. Please comment if you have tried anything from this line! I am going to be in Las Vegas next month, and I will definitely be adding a bottle of this to my collection and checking out the other fragrances. Update: just wanted to add that I did visit the Acca Kappa store, and bought a bunch of soaps. All of them were wonderful, especially the Calycanthus. OK dear R – I have to blurt out that I have been DYING to try this since a friend Robin (Mreenymo) told me about this. I looked all over Rome for this and people kept pointing to their brushes. I was so disappointed. Anyways – I am in love with SMN Calycanthus which is really pretty too. This will have to do till I try this rather elusive Acca Kappa. PS: I admit that I have not bothered to look in Paris yet – will try Printemps and Bon Marche – knowing the way the French “dig” foreign fragrances – I will have no luck here. N, I am so surprised, I would have thought the line was much easier to find in Italy! The french Sephora site shows that they carry Acca Kappa, but I don't know if they have the fragrances. Hi R! Tell me about it – I thought so too. I went from one perfume boutique to the other and to the departmental stores in Rome. Thanks for letting me know about Sephora here. I do know that Sephora carries the hair brushes etc. It's a floral lover's, floral. A true-to-life, floral. I often feel that people who claim to not be “floral – appreciative”, haven't tried one such as our Calycanthus here. So well done! Acca Kappa brings a fragrant & ethereal Italian garden to us! H, thanks again for sharing it with me! Great fragrance, and LOVE the price. I was thinking that I needed to plant a Calycanthus shrub — but then realized I might already have one. Have to find out for sure if that is what it is. R, thanks so much for featuring this floral gem today! As you know, I love it, and have been wearing it off and on since I discovered it in January. I wish they made an EDP, but layering the fragrance with their soap and lotion (both of which I love, too! ), makes it last longer. And thank you so much for your extensive research on the Calycanthus shrub and your comparison of AK's Calycanthus to SMN's version. One of these days I'll get over to the SMN store in LA to test their Calycanthus. I absolutely love the Calycanthus perfume and their body lotion. The lotion has rice bran which is so silky soft for your skin. The more you layer the better the smell for this fragrance. I also bought the deodrant spray as well which smells just like the perfume. Unbelievable!!!!! Check out the white moss from Acca Kappa as well. The White Moss seems to be very popular but didn't work for me personally. Loving the Calycanthus soap though! I just bought SMN Calycanthus – and I love it. I am not a floral lover butthis drys down to a spicy scent. It's so yummy.